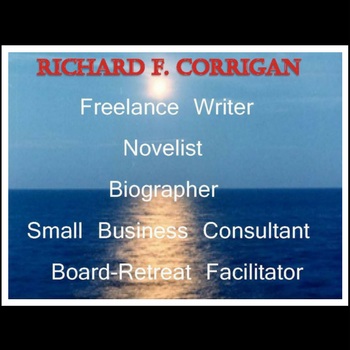 Richard F. Corrigan — Freelance Writer, Biographer, Novelist, Small Business Consultant, Board-Retreat Facilitator. November 2013, signed multi-book publishing contract with Zharmae Publishing. First novel, KRYSTAL VISION (KRYSTAL VIBRATIONS SERIES) released April 2016. Second in the series, KRYSTAL SCENT to be published summer of 2017. GROW YOU GROW YOUR PROFITS (nonfiction) to be published spring of 2017.